This project is to establish, maintain and use a native plant and pollinator demonstration garden. Started in 2016, the Isle of Wight Courthouse Native Plant and Pollinator Garden will provide food, water and cover for a diversity of pollinator wildlife species and will illustrate the value of conservation landscape practices for wildlife habitat and water quality. The garden is used for ongoing educational outreach programs for a variety of audiences such as homeowners, local community groups, teachers and students. In 2014 our chapter was selected to participate in a citizen science program funded by a grant from the National Science Foundation. The program, led by VMN staff, was to develop citizen science protocols for wider use. Our chapter took part in developing training programs and then selected the Stilt Grass project as a model. The test program is now in its fourth year looking for the best practical method of controlling the invasive stilt grass. Test plots are monitored several times a year and given a variety of treatments (de-thatched, burned or Roundup treatment, or combined approaches) designed to eliminate the grass. It is intended that results be published as a scientific paper in 2019. April 1st through the end of August. As citizen scientists, we observe, collect, and record data, and compile a year-end summary of our findings which is reported to the Virginia Bluebird Society. This becomes a permanent part of their research data and documents the health and vitality of this species in our county. 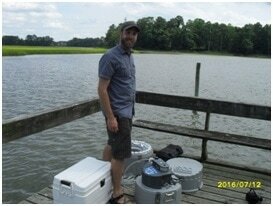 Historically, the Nansemond River Preservation Alliance (NRPA) has been sampling and reporting on the water quality of the Nansemond River. The upper river and many of the tributary creeks have had elevated enteric bacterial counts that keep them closed to shell fishing per the VA Dept. of Health (VDH). Thanks to a recent increase in funding by the legislature, the VDH has begun a much more in depth study of this problem. For the last six months, they have been doing frequent samples of some 60 or 70 locations in the river, both in dry and post rainfall conditions. NRPA has been assisting this effort both in collecting and interpreting the data. Several members of our VMN chapter, especially Geoff Payne, have been very involved with both the fieldwork and attending meetings with VDH and Suffolk officials. 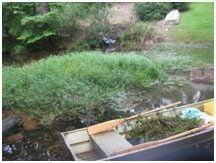 This project is a partnership with the Virginia Department of Game and Inland Fisheries (DGIF). The Virginia Birding & Wildlife Trail (VBWT) is a state-wide driving trail that links together sites for birding and viewing wildlife. It is organized into 65 driving trail loops with 637 individual sites. Ownership of these sites varies from public to private. It has been many years since they have been established and are in need of some tender loving care. Our Chapter has adopted the Tidewater and Suffolk Loops. Our job is to go to each site and hike at least part of the trail(s) four times per year, or once per season, and contact the site owner once per year. While visiting and hiking the site, we are to document information on a provided checklist; bird the site and record those observations in eBird; and record any wildlife observations with pictures in iNaturalist. The goal for DGIF is to increase awareness, appreciation and conservation of Virginia’s wildlife and beautiful natural habitats. Our goal is to assist them by providing current information to update their records and website, and increase eBird and iNaturalist activity for Citizen Science and VA Wildlife Mapping (especially VA Herp Atlas). This project recycles discarded fishing line to prevent the entanglement and killing of wildlife both on land and water. The VMNSHC has built and installed bins that collect unwanted line at 4 sites in Suffolk and one in Smithfield. The line is collected by our group and the hooks, sinkers, and braided line are separated out. The monofilament line is then sent to Berkley Recycling to be recycled. 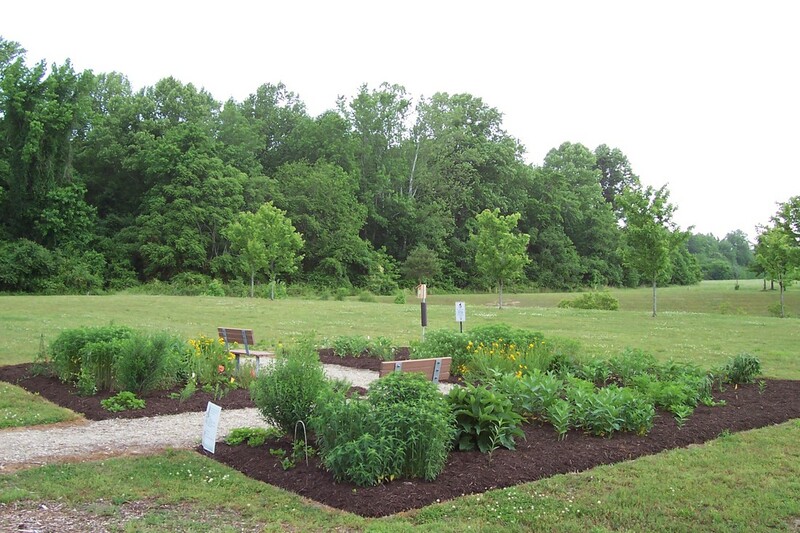 The Western Branch Intermediate School Living Lab is an outdoor classroom space containing a three-tier pond, four raised gardens, a pollinator garden, a blue bird house with a nest cam, decking, and picnic tables. The committee chairperson is VMN master naturalist Kim Hogan. The Living Lab provides hands-on learning for the students. It is maintained through a partnership with the Green Meadow Point Garden Club's Master Gardeners and student volunteers. The program reaches approximately fifty to seventy-five students a year. In addition to educating students about the plants and animals that live in the lab, students enjoy eating lunch out at the picnic tables and participating in events like the holiday decorating day. Alligator weed is an aquatic invasive found in many waterways of Isle of Wight and Suffolk. It has a huge potential for taking over ponds and clogging outflow pipes leading to loss of functional habitat and disruption of normal flow around water systems. 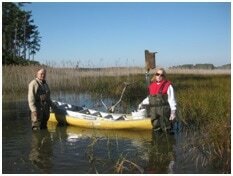 VMN members, Stella and Geoff Payne, are engaged in efforts to educate and encourage waterfront owners to act as quickly as possible in its eradication as the weed emerges. Volunteers in this effort can be involved in outreach by educating neighbors and others on how best to eradicate the weed and/or help waterfront owners who may need help in pulling out the weed. NOAA sponsors an endeavor across the United States to engage citizen scientist volunteers in collecting precipitation data in the areas in which they live. It is called CoCoRaHS which stands for Community Collaborative Rain Hail & Snow network. The data is collected and added into the CoCoRaHS site on a daily basis and that is used by a number of agencies and others in planning and understanding the precipitation and adding to that ongoing history. Anyone who participates, purchases their own rain gauge setup, and by collecting that information for this project, receives 2 hours/month of volunteer time. Project RareQuest is a pilot project to involve trained VMN volunteers in monitoring the occurrences of rare species of plants and animals, many which have not been seen in years. It is in partnership with Virginia’s DCR Natural Heritage Program and is funded in part by the Virginia Native Plant Society. Two small teams from our chapter were tasked with trying to locate certain plants and a small bird called Swainson’s Warbler. Both teams had partial success in their searching. The rare Pond Cypress with its upright leaves and dome topped knees was not on the search list but wanted to be found. Naturalist John Bunch did it the favor. Right now, VMN is not accepting any new volunteers in this project until all the data is collected and evaluations are made on the success. Vernal pools are temporary pools of water often found in woodland environments. 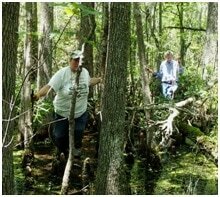 The Vernal Pool Cooperative of Virginia is an opportunity for Citizen Science field work for Master Naturalists as you collect data on vernal pools to facilitate research on these unique amphibian environments and their role in forest habitats. Visits to specific pools to collect data are year round, over a period of years. Data is recorded on the Colorado State University web site CitSci and monitored by VCU Professor Anne Wright, with separate reports provided to DGIF and to the stewards of the public lands on which the vernal pools are found. Training and special equipment are necessary. Frog Watch is a citizen science program of the Association of Zoos and Aquariums. Participants undergo advance training to learn about wetlands and to identify amphibians in their communities then gather data to help conserve frogs and supporting habitats. 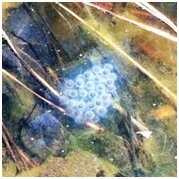 It provides us with opportunity to work individually or as a group to monitor amphibians in our own community. "“The "Southsider” is the quarterly newsletter of the Historic Southside Chapter of the Virginia Master Naturalists which is posted on the chapter website (http://www.vmnhistoricsouthside.org ). It is a compilation of articles and photography about ongoing Chapter projects along with updates, announcements, and columns for entertainment. The newsletter is a group effort in that all articles are written and contributed exclusively by the chapter’s members. It’s an excellent way to earn volunteer hours and to highlight the many important projects within the Historic Southside Chapter of the Virginia Master Naturalist. The Wood Duck Box project was designed to provide nesting cavities for wood ducks in areas where nesting sites are limited. 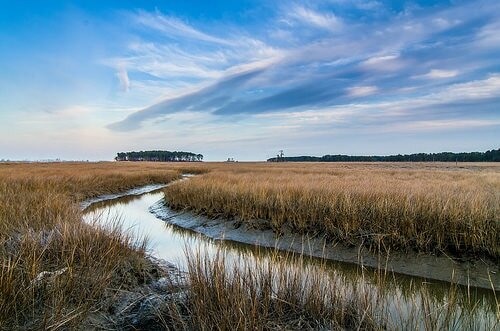 Under the direction off the Virginia Department of Game and Inland Fisheries sites were located at the Hog Island Wildlife Management Area and the Carlisle Tract in Surry County, Virginia. Initial boxes were built as a chapter project and installed by Mary Jo Leber, Geoff Payne, and Ron Stephens. Boxes are monitored yearly and nesting materials are replaced as needed. 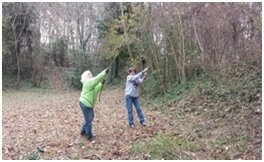 In another wood duck box project approximately fourteen VMN volunteers from our chapter assembled and installed 10 wood duck boxes along the marsh edges of Windsor Castle Park in Smithfield. High schooler Ashlyn Newberry and her father--both from cohort IV--developed the project, secured the materials and oversaw the event which took place in early 2016. Now our members are looking for the first inhabitants to settle in and will make sure their new homes are properly maintained. 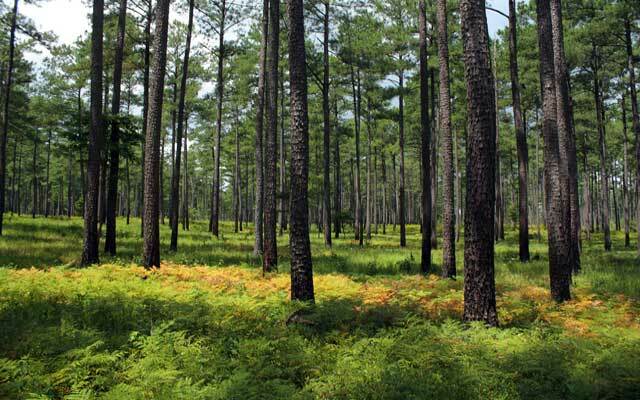 The Acorn and Seed collection is sponsored by the Virginia Department of Forestry to help continued effort to produce quality seedlings for Virginia Landowners. Every year, we have the opportunity to support this effort by collecting acorns and seeds in our own community. This is a great opportunity for us to engage our families in a fun activity while helping to preserve our state native trees. The Mayor’s Monarch Pledge is an initiative created by the National Wildlife Federation to encourage municipalities to be proactive in protecting monarch butterflies and their habitat. This project is a collaborative effort with the Town of Windsor, the Windsor Branch of the Blackwater Regional Library and VMN-HSC. All NWF Mayors’ Monarch Pledge action items identified by the Town of Windsor were completed in 2017. The chapter continues to work with the Town to identify and complete stewardship, education and outreach opportunities. A pollinator demonstration garden using native plants was established in front of the Windsor Library in 2017. Garden maintenance needs are identified and completed by the chapter on a seasonal and monthly basis. The chapter works with the library to identify and schedule presentations and events, as well as garden education and outreach opportunities. This stewardship project seeks to care for this historic park by removing debris and overgrowth from its natural areas and historic earthworks. Volunteers meet regularly the third Saturday of each month, weather permitting, at Fort Boykin to clip back brush, vines, and/or weeding, along with the removal of storm debris and fallen limbs.